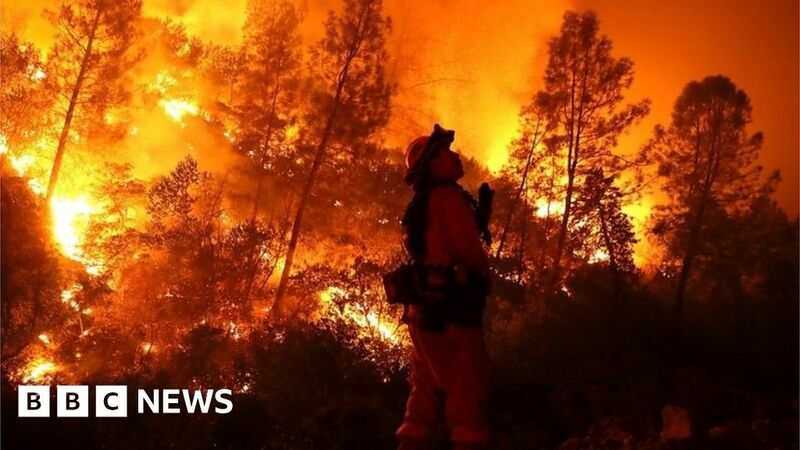 A US mobile network has admitted it should not have slowed California firefighters’ data speeds as they tackled what has become the largest blaze in the state’s modern history. Santa Clara County’s fire chief has complained the company throttled an emergency vehicle’s data rate to about 0.5% of its normal level. The limit was enforced despite Verizon being told it was hampering efforts to tackle the wildfire. Verizon said a mistake had been made. However, it highlighted that the fire department had subscribed to a contract that stated data throughput would be cut after a usage limit had been hit. “Regardless of the plan emergency responders choose, we have a practice to remove data speed restrictions when contacted in emergency situations,” a spokeswoman told the Mercury News newspaper. “In this situation, we should have lifted the speed restriction when our customer reached out to us. The incident was revealed in court papers filed as part of several states’ efforts to reverse a repeal of the US’s net neutrality rules. Santa Clara County Central Fire Protection District is supporting the challenge on the basis that it relies on dependable internet access. The news site Ars Technica was first to report the complaint about the problems experienced while trying to subdue the Mendocino Complex fire. In his evidence, fire chief Anthony Bowden said that the vehicle affected was normally used as a mobile command-and-control unit at major emergencies. “It relies heavily on the use of specialised software and Google Sheets… to track, organise, and prioritise routing of resources from around the state and country to the sites where they are most needed,” he said. Doing so, he added, involved the use of up to 10GB of data a day. “Even small delays in response translate into devastating effects, including loss of property, and, in some cases, loss of life,” he said. Email correspondence between Verizon and the fire department revealed the company had explained to Mr Bowden’s colleagues in June that under the terms of their plan, speeds would be throttled once 25GB of data had been used in a month. But the matter had not been resolved by the evening of 29 July when a fire captain emailed the internet provider to flag that this restriction was impeding efforts to tackle the Mendocino Complex blaze. He wrote that the vehicle’s downloads had been capped at 0.2Mbps, “meaning it has no meaningful functionality”. At the time, news reports were warning that 4,500 buildings were at risk from the Northern California wildfire and that seven firefighters had been injured trying to subdue it. “Remove any data throttling… effective immediately,” added the department’s IT officer in a follow-up message. “Rather than restoring us to an essential data transfer speed, they indicated that County Fire would have to switch to a new data plan at more than twice the cost and they would only remove throttling after we contacted the department that handles billing and switched to the new data plan,” said Mr Bowden. The result, he added, was that his department had temporarily had to rely on other agencies’ equipment. “In light of our experience, County Fire believes it is likely that Verizon will continue to use the exigent nature of public safety emergencies and catastrophic events to coerce public agencies into higher cost plans ultimately paying significantly more for mission-critical service – even if that means risking harm to public safety during negotiations,” he said. However, Verizon disputes this claim. “This situation has nothing to do with net neutrality or the current proceeding in court,” it said in a statement.